Perhaps I get a little carried away calling everything the World's Largest. 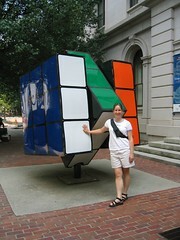 But until we discover otherwise, I'm going to persist in my belief that we discovered the LARGEST Rubix Cube. This was a find while roadtripping. We actually do a lot of research to find giant attractions, factory tours and crazy stops before we travel, so this one took us completely by surprise. We happened to stumble upon this in front of an Art Museum in Knoxville. The cube is very accurate, with each side being a different color and the cube in the process of being turned. We don't have exact directions, but it's up Market Street near Market Square. We passed this on our way to 'Tomato Head' a vegan friendly restaurant in the city. From the World's Largest Guitar to Graceland to Jack Daniel's, it's all in here. See what we thought the must-see, cannot miss attraction of Tennessee is.